The critical difference between replication (with enhancements) of the classroom experience and the potential for the transformation of the classroom experience lies not necessarily in technology, but in four aspirations: A learner focus, an emphasis on interactivity, scalability, and a quest to reduce costs while maintaining quality. 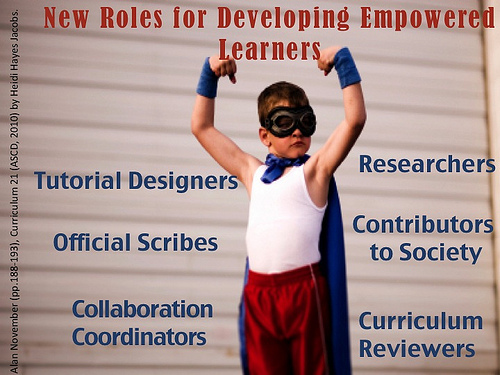 We see transformation happen when faculty members don’t see themselves as mere instructors, but as designers, coaches, and members of a learning development team with particular goals in mind. – Steve Minz, InsideHigherEd, “Next Generation Online Learning,” Nov. 19, 2014. Honestly, this statement is right on the money. So often the motivation for changing our pedagogy is to chase some bright and shiny technology. Of course, in the chase we realize one person can’t know it all (technology, that is), which is all we needed in the first place – gather a team of complementary disciplines and focus on the learner. Steve Minz goes one further – change the role of the student: not a consumer but a participant creator contributor. I am doing that in a small way in a course I’m teaching right now. I have 3 extra credit assignments for students to provide content in the form of assignments which might more simply teach a concept than those I use already, or already existing YouTube videos with high explanatory value. Thr0ughout the course I emphasize the need to learn from the course activities which kinds of activities are best for the way the individual student learns. I want to help in the formation of students who take charge of their own learning. For a lifetime. Next Next post: Notre Dame wants to get to know a Sakai developer – is that you?